Early rise defines each moment of the day with success, confidence and victory. Positivity in remaining calm, focused and realist ultimately realizes the vision of the dreamer. Surya Namaskar (Yoga and Pranam to Sun god) purifies mind and body of the person. It is difficult for a person to rise early due to habitual routine of sleeping late and indulging in material activities through-out his busy day. First a person should mentally prepare that he has to adjust and re-structure his daily planned activities to suit his life. Working for life is important and not life working for something else or money. There is wrong notion that waking up early morning is knocking the devil’s door. This false concept was popularized by Abrahamic cultists; islam and christian missionaries, who are habitual to sleeping late at night denying and ridiculing Vedic way of life to salute rising sun daily during Brahma Muhurat (the most favorable time at the start of the day when surrounding is filled with positive aura for attaining Brahm Gyan – 04:00 a.m. to 05:15 a.m.). To oppose the concept of Arya mode of living, they simply follow demonic traits of life and dwell into dark hours of night to become liar, deceitful, drunkard, invader, looter and terrorist. They get encapsulated deeply in the negative vibrations and thoughts to the no point of return. When invaders came to India, they saw civilized and scientific form of living practiced by Hindus, natives of Bharat. After seeing opulence and endless prosperity, happiness of the nation – they did deep research and found that waking up early means extra 3 hours per day which is the most productive and healthy time of the day. Gradually british and few mughal invaders subscribed to this Sanatani routine of life. 1.1 What is the proof that Vedic Pattern of Life Give You Success? 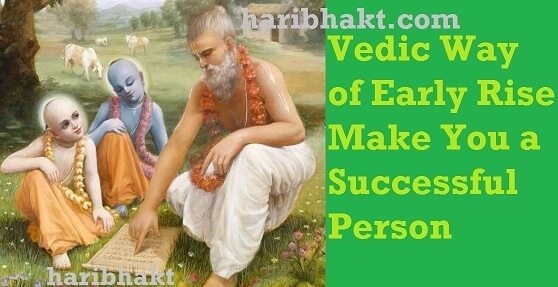 What is the proof that Vedic Pattern of Life Give You Success? Vedic pattern of waking up early and tuning life the way one wants to lead, is today adopted by billionaires and stalwarts across globe. We all are materialistic beings who live a lonely or a family life but curiously want to know a trick be a successful person to rise standard of living and work for the development of the country. Let us check out how Vedic pattern of early rise made few people renowned in short span of life. We will consider some people who were not brought up in a Hindu way of life (or are in a foreign country) but are practicing the Vedic methodology, at least during the start of their day, not ritually but by waking up early. General Motors CEO Mary Barra starts her day 5:30 a.m.
Vodafone CEO Vittorio Colao starts his day by 6 a.m.
Apple CEO Tim Cook wakes up at 3:45 a.m.
Virgin America CEO David Cush wakes up at 4:15 a.m.
Starbucks CEO Howard Schultz wakes up by 5:30 a.m.
Michelle Obama wakes up by 4:30 a.m.
AOL CEO Tim Armstrong starts his day at 5:00 a.m.
PepsiCo CEO Indra Nooyi wakes up by 5:30 am. GE CEO Jeff Immelt rises at 5:30 a.m.
Xerox CEO Ursula Burns wakes at 5:15 a.m.
Twitter and Square CEO Jack Dorsey wakes up at 5:45 a.m.
NextDesk director Dan Lee starts day at 3:30 a.m.
Fiat Chrysler CEO Sergio Marchionne wakes up at 3:30 a.m. Famous investor Kevin O’Leary wakes up at 5:45 a.m.
CEO Kara Goldin rises before 5:30 a.m.
PIMCO cofounder Bill Gross starts his day by 5:30 a.m.
Warren Buffett wakes up at 6:45 a.m. It is easier said than done – how easy it is to break the regular pattern of life and rise early to re-define life’s priorities. We will share methodical habits which help in changing the daily routine to make you wake-up early. It is gradual but sureshot successful process. The most productive is, set mobile phone alarm to heavy volume for 5 to 10 different ‘wake-up’ times. Keep it far away from your reach. Make your mind thoughtless and calm by regular chanting of any Vedic mantra you know by closing your eyes as you sleep. Close the eyes and do Shakti Mudra for 10 to 12 minutes. In order to do this mudra, join little fingers and ring fingers of both hands. Fold the middle and index fingers loosely over the thumb. Then, you need to bend the thumb towards the palms. While doing this mudra, proper concentration and focus should be given to the process of breathing in the pelvic area and the exhalation should be lagged. If your sleeping problem is acute, then you can go on exercising it as needed or until the good result is obtained. This mudra accelerates the respiratory impulse in your area of the chest. It gives a calming and soothing effect and it also ensures sound sleep and relaxation to people. Allow yourself to sleep earlier. Avoid all distractions, just focus on sleeping early, preferably by 9 p.m. or at the maximum by 10 p.m. You might be used to staying up late, perhaps watching TV or surfing the Internet. But if you continue this habit, while trying to get up earlier, sooner or later it has to be given up. Make yourself tired. You can massage yourself on legs or hands. Read a lot about stuffs that bore you. And if it is the early rising that gives you inspiration, then you will crash and sleep late and have to start over. Get to bed earlier, even if you don’t think you’ll sleep, and read while in bed. If you’re really tired, you just might fall asleep much sooner than you think. Go out of the bedroom as soon as you shut off the alarm. Don’t allow yourself to rationalize going back to bed. Just force yourself to go out of the room. Get into the bathroom for daily chores. Wash your face and gargle your mouth. Do not rationalize. If you allow your brain to talk you out of getting up early, you’ll never do it. Don’t make getting back in bed an option even if you want something that is lying on bedside. Give it a break of 10 minutes. Have a good reason. Set something to do early in the morning that’s important. This reason will motivate you to get up. Take into writing, work-outs, reading, browsing powerful quotes in the morning. Take advantage of all that extra time. Don’t wake up an hour or two early just to read news or some social media comments unless that is part of your business to update yourself with latest happenings. Don’t wake up early and waste that extra time. Start your day preparing a to-do list, task breakdown, plan of the day, meditation, prayer after bathing or things that you like. Most inspiring for all Indians is life of national leader Narendra Damodardas Modi. A person rising to the top from humble background due to his good habit of attuning life by starting his day early in the morning. Prime Minister Narendra Modi ji works for 18 hours a day and also expects the same dedication from his ministers. He closely monitors each job and then keeps an eye on reactions to it. Political analysts proclaim Modi`s way of work as the corporate style. His speeches throw tips like a successful CEO. He wakes up at 4 am. In his whole day, he never takes a nap till night. After waking up, he first goes with daily course and then perform Suryanamaskar, Pranayam and Yoga. The Vedic routine helps him stay fit and energetic. He scrolls through the last day tweets and the PMO website to look at the reactions received. Then he highlights important suggestions of the citizens and shares them with respective departments. During browsing net, he takes Gujarati ginger tea. 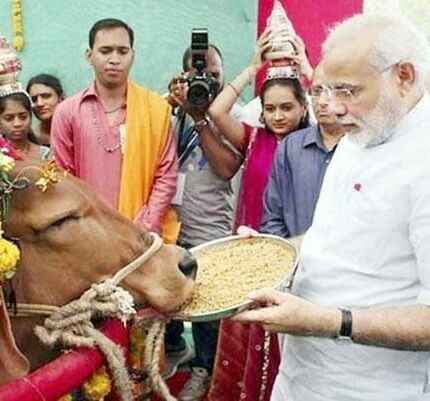 Followed by vegetarian breakfast of boiled or roasted stuff at 9 a.m. Modi ji starts his office by 9:30 a.m. sharp and monitors performance of cabinet ministers, attends meeting with ministers, officers also personally get into the details of presentations prepared for him on latest projects. Modi ji is a good listener and a fast learner. Narendra Modi ji reaches home by 7:30 pm he still is in contact with his ministers via phone on contingencies and important ad hoc activities. By 9:00 pm after his dinner he completes his pending file work and goes through the routine of the next day. There is no fix time of sleeping due to busy schedule and several launches of projects. Sometimes goes to bed very late at night, good part is Modi ji sleeps in 10 to 15 seconds as soon as he rests on the bed. This shows he has the ability of keeping his mind thoughtless and calm while preparing to sleep. The dedication and focused energy towards his work from the start of the day would ensure Modi’s Prime-ministership extends to his next tenure (2019-2024). Ajay Mohan Bist a shy boy from Pauri (Garhwal) born in a middle-class family went on to become CM of the most populated state of India due to his great habit of rising early. Yogi Adityanath ji’s current schedule changed a bit when he became CM of Uttar Pradesh. However it is not much different since the time he became Hindu monk then MP of Gorakhpur, his daily routine is inspirational for the youth of today. Yogi ji wakes up at 3 a.m. in the morning and goes to bed at 11 p.m. in the night, sometimes this stretches to 12 a.m. too. After daily chores, he performs dharmic activities of offering prayers, practices yoga. He then checks cleanliness and upkeep of the surrounding before heading to the cow shed. He feed cows with his hands calling their names. After spending some time with the cows, he moves to his makeshift simple office at his home and checks important files. His morning meal consists of oatmeal, chana and papaya with milk. He later listens to the grievances of people, makes up some calls, emails to the concerned people before spending the rest of the day working for the people of UP. Yogi Adityanath ji reaches office before 9:30 a.m. and this ensures presence of officers and ministers right on time to work with UP CM. Later on he presides over the meeting and presentations of the prioritized tasks. Good habit of waking up early and enlarging his scope would prove prediction correct that in 2024 Yogi Adityanath ji will become PM of India. You get to live once in a life. Make a lasting mark, you got a human body after thousands of years of penance – work for yourself, family and country. Do not waste it sleeping extra hours. Already we spend 1/3rd of our life napping. Its time to change the schedule for the good. Choice is yours, whether you want to lead a Vedic way of life as a successful person or follow Abrahamic principle of partying, sleeping late at night and starting day behind other people. Please feel free to talk to this Hindu guy his family and others to know their intentions. It seems they are interested in making you their daughter in law. There is no cultural gap as you can speak Hindi and love to practice Hindu culture. Please do this and you will be accepted by your to be in-laws soon. While i learnt many wonderful things and while i am thankful – i would also like to express that your articles on Gandhi and Nehru while portraying Modi and UP CM is reflecting a sense of hypocracy – on one side you talk about some wonderful things and then you are politicising. Not leaving a good taste.